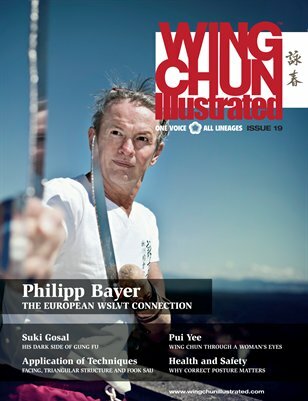 Issue 19 of WCI features Sifu Philipp Bayer on the cover. Philipp first became involved in the martial arts in the early 1970s. Eventually, he was attracted to the Chinese art of Wing Chun, but following the loss of his left hand in 1980, it looked as if his opportunity to train was over after his then instructor declared that he was no longer teachable due to his injury. Philipp decided to travel to Hong Kong to seek out an instructor who would teach him, but after visiting various instructors, Philipp did not find the satisfaction he hoped for. That is, until a chance encounter with a man who suggested he visit the school of Sifu Wong Shun Leung. In January of 1983, Philipp formally became a student of WSLVT. For a complete table of contents, please visit our website.